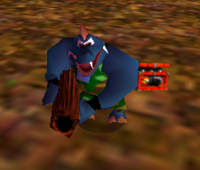 The orange grenade launcher is the strongest gun in Donkey Kong 64. It is Krusha's personal weapon and can only be used by him. However, Krusha is not playable in adventure mode, making the weapon exclusive to Multiplayer mode only. As opposed to throwing an ordinary orange, which explodes after a few seconds, the Oranges shot from the orange grenade launcher explode on impact. It does more damage compared to the other launchers; however, it can also cause damage to Krusha if the explosion is close enough to him. ↑ Donkey Kong 64 Official Nintendo Player's Guide, page 123. This page was last edited on September 20, 2018, at 11:54.